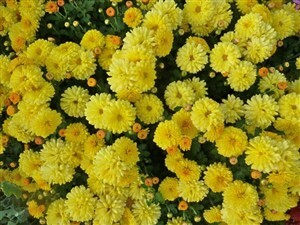 Chrysanthemum 'Nantyderry Sunshine' A brilliant, hardy, utterly reliable yellow pom-pom Chrysanth. It goes very well with Bronze Elegance also known as Peterkin but not with Mei-Kyo or the other pinky pom-poms. Flws October into Nov. Came through the winter of 2010 unscathed.